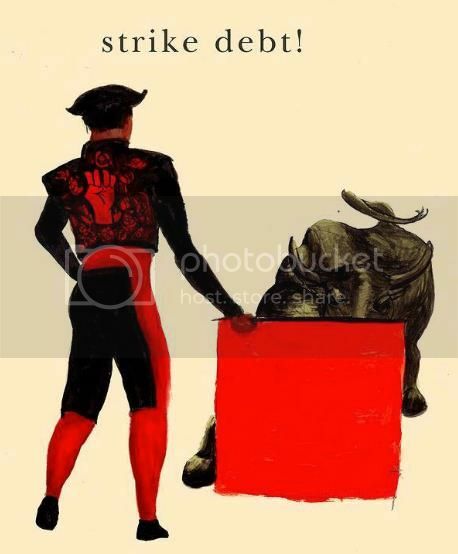 The Strike Debt movement is planning a Rolling Jubilee—a bailout of the people, by the people. 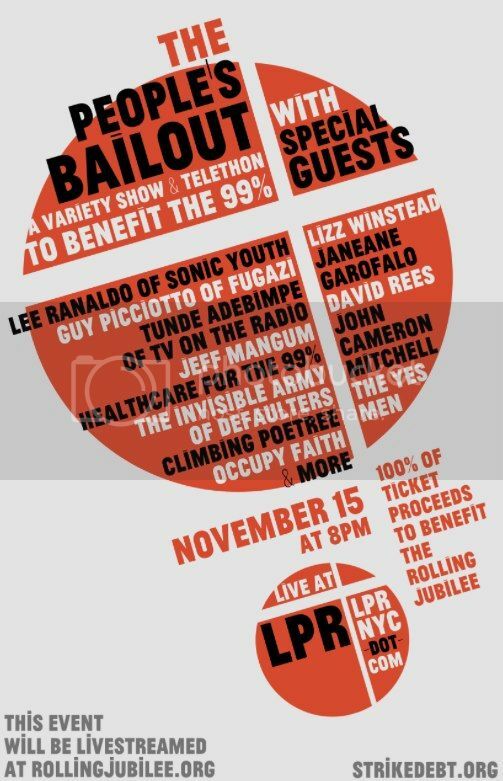 Strike Debt, a movement formed by a coalition of Occupy Wall Street groups looking to build a popular resistance to debt, plans to hold a telethon and variety show November 15 in support of the Rolling Jubilee, a system to buy debt for pennies on the dollar, and abolish it. The telethon, which has already sold out, will feature artists including Jeff Mangum of Neutral Milk Hotel, Lee Renaldo of Sonic Youth, Guy Picciotto of Fugazi, Tunde Adebimpe of TV on the Radio, plus other surprise guests. Strike Debt hopes to raise $50,000, which the group claims can then be used to purchase, and eliminate, around $1 million in debt. The group has already performed a test run on the debt market by spending $500 on distressed debt, buying $14,000 worth of outstanding loans and pardoning the debtors. Business Insider called the test run “impressive” and “noble,” although Alex Hern at the New Statesman points out that, while the law is on Occupy’s side, the banks may not be. Hern points to Felix Salmon’s discussion of the American Homeowner Preservation, which sought to buy up distressed mortgages and find ways for the homeowners to stay in their homes and pay off their debt. David Rees, one of the organizers behind the project, writes on his blog: “This is a simple, powerful way to help folks in need – to free them from heavy debt loads so they can focus on being productive, happy and healthy. Now, after many consultations with attorneys, the IRS, and our moles in the debt-brokerage world, we are ready to take the Rolling Jubilee program live and nationwide. “As we’ve seen on the East Coast in the aftermath of Hurricane Sandy, we, the people, are the ones who are best equipped to provide the help that damaged communities need,” Strike Debt stated in a press release. The wonkier subgroups of Occupy Wall Street such as Strike Debt and Occupy the SEC are interesting because these resistance fronts are familiar enough with the jargon and inner workings of the financial system to fight for reform from the inside out. In the case of Occupy the SEC, activists petitioned financial regulators to help ensure that Dodd-Frank reforms are implemented in a way to keep pressure on the big banks, whereas Strike Debt hopes to turn the opaque debt market into an advantage for the 99 percent. Occupy activists have lately been in the business of transforming philosophical debates about class inequality and government corruption into real, tangible solutions. This month alone, activists have been praised for their work in the aftermath of Hurricane Sandy in which it was often Occupy activists—not the Red Cross, US military, or FEMA—helping to dispense aid to devastated communities. Now, it is Occupy activists who plan to buy up debt and help some individuals who have long suffered under the crushing weight of debt. For more updates on Occupy Wall Street, check out Allison Kilkenny’s coverage of Occupy Sandy, which is bringing needed relief to the most devastated communities.